We were having so much fun doing the track days that we decided to take the MCRA race clinic where we obtained our MCRA race licenses. Chris, myself and my buddy Bobby all took the clinic on the same day. At the end of the clinic we have a “mock race” where the goal isn’t to win the race but to get a feeling for how to line up, start, heed all the flags, deal with an ambulance on the course, and most importantly not crash. If you crash you fail the clinic and do not get your license. 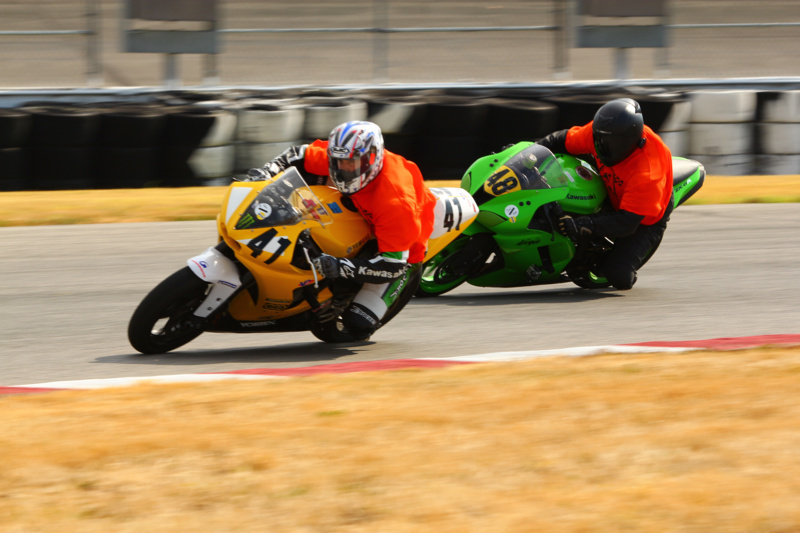 Bobby took the holeshot on his Yellow R6 and I pulled in behind him. Even though the goal was not to finish 1st in this race it’s hard to just let your buddy take the win so I put the move on him a couple laps in. I entered my first real road race in the Sportsman Class when we were at Heartland Park. I entered the race at the very back of the pack since I was new at this and all the other guys in the class had been racing all year. I just wanted to ease into the racing and be very conservative. Having said that I fully expected that I would be able to work my way up through the pack and finish somewhere around mid pack. Chris didn’t enter any races in 2012 because we wanted him to have the option of running the entire season in the Sportsman class. You can only run that class one year, so I must run the Amatuer GT class next year. Chris has the option of running the Sportsman class or the Amatuer GT. Well, there you have it. We’re now prepping for 2013.